Skill, discipline and a knack for the bright lights are some of the qualities of marquee football player. 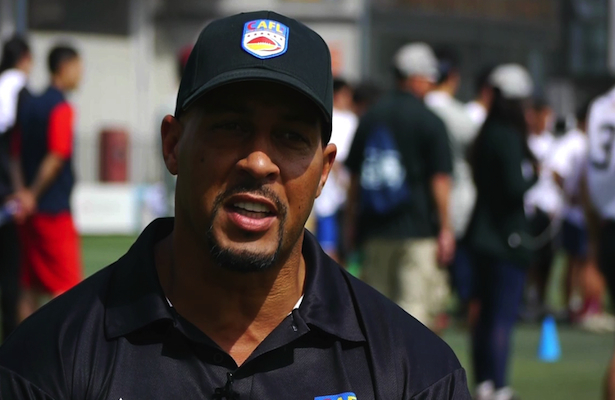 Robert Gordon displayed those traits as a wide receiver in the Canadian Football League for 13 seasons and hopes to pass on those skills to players in the China Arena Football League as its newest head coach. Given his track record you can expect his teams to play at a high level, with toughness and maybe a flair for the dramatic. After graduating with a degree in criminal justice the from University of Nebraska, Omaha in 1991, the four- time North Central Conference All-American took his talents north of the border. He landed in Ottawa and in his first season used his blazing speed to average 16.4 years per reception. After stops in Toronto, British Columbia and Edmonton, Gordon took a year off to try his hand in the Arena Football League. In 1998 he helped the Orlando Predators to the Arena Bowl Title hauling in 61 passes for 855 yards and 19 touchdowns. After hoisting the trophy it was back to the CFL where he played six seasons with the Winnipeg Blue Bombers. By that time he had gained the nickname “Bobby Gorgeous” and in 2000 his star was shining. That year he had 89 receptions for 1,395 yards and seven touchdowns. The following season he led his team to a league best 14-4 record but they were upset by Calgary in the Grey Cup Final. It was around that time that Hollywood came calling as Gordon picked up film roles in Any Given Sunday, We Are Marshall, Invincible, The Game Plan and Second String. In the CFL off seasons of 2001 and 2002, Gordon returned to the AFL to play for the Detroit Fury. Indoors in 2001 he caught 25 balls for 1,630 yards and 42 scores. After three more season in Winnipeg Gordon finished his playing career with the LA Avengers in the AFL. After football, the criminal justice major put his education to work as a correctional officer with the Manatee County (Florida) Sheriff’s department for four and a half years, but he never lost touch with the game working various training and conditioning camps. Then in 2014 he took his coaching to another level. He was on the staff of the Fall Experimental Football League’s Omaha franchise. The next season, a guest coach appearance with the Seattle Seahawks prepared him to be the offensive coordinator, head coach and general manager of the FXFL’s Hudson Valley Fort. needs as it moves into its second season. Newer → CAFL 2017 Shanghai Combine a Resounding Success!